Car advocates call it ”lane theft”—but could it save lives? On a late afternoon in May, about 50 bicyclists gather in the Rose Bowl parking lot, some sporting black armbands. 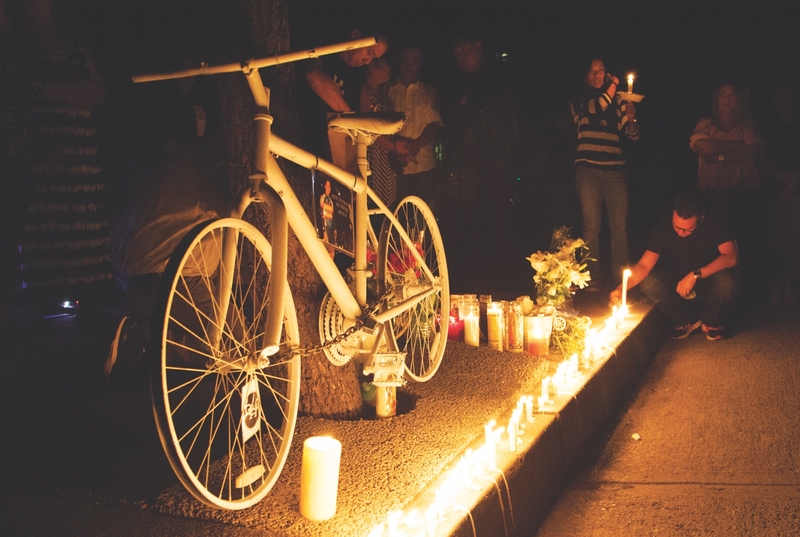 They’re here for the annual Ride of Silence, one of several such events taking place around the world—including in North Hollywood, Fullerton, and Thousand Oaks—to honor cyclists killed in traffic accidents. More than a memorial, the ride is intended to call attention to the perils cyclists face every day. Huynh belongs to the Pasadena Complete Streets Coalition, which backed a recent effort to reduce a section of Orange Grove Boulevard from four lanes to two in order to make room for buffered bike lanes. The plan was tabled the day after being presented at a community meeting in which motorists expressed the same outrage seen on the Westside of Los Angeles over bike lanes introduced there. 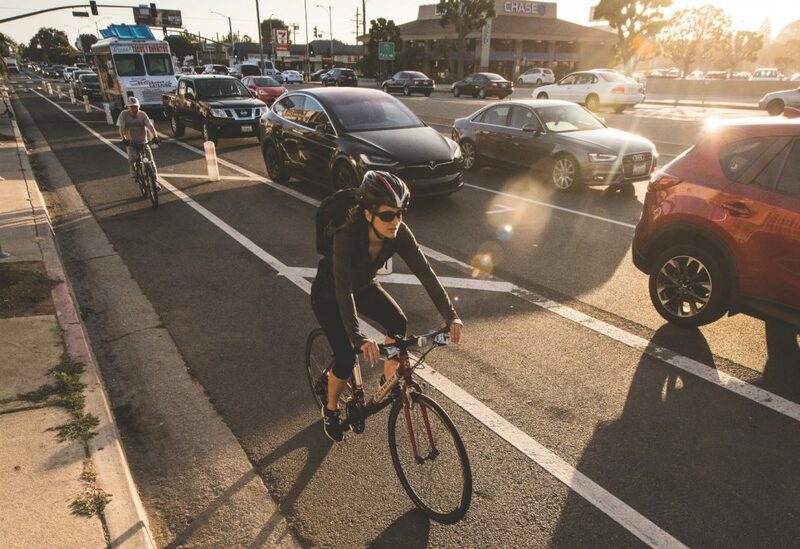 In Playa del Rey, several bike lanes were removed last year after a citizen revolt. The latest flash point for road diet opponents is a 0.8-mile stretch of Venice Boulevard in Mar Vista that was reduced from six lanes to four last year to make room for a protected bike lane. Though cyclists like the ones at the Ride of Silence might feel differently, road diets aren’t really just about bikes. They’re designed to slow down drivers and reduce traffic accidents as part of Vision Zero, the ambitious initiative adopted by the city to end all traffic-related deaths in L.A. by 2025. A pedestrian or cyclist is eight times likelier to survive a collision with a car traveling 20 miles per hour than one zipping along at 40, and a 2016 study by the L.A. County Bicycle Coalition reported that “bicycle crash risk” dropped by an average of 42 percent on eight L.A. roads after bike lanes were installed. But road diet opponents argue that, with the aid of navigation apps like Waze, frustrated drivers are simply spilling over onto side streets, often at unsafe speeds. “We’ve taken the cars off the boulevards, which are basically these streets designed to get large volumes of traffic through town, and we’ve moved those cars onto the residential streets,” says Russo. According to his own analysis of CHP data, collisions along the road-dieted stretch of Venice Boulevard have actually gone up, as have pedestrian injuries on the neighboring “cut-through” streets. However, a representative for LADOT says the Venice Boulevard collision statistics, which cover only about seven months, aren’t conclusive. There’s lots of other murk around the issue: Cycling deaths across the region have declined by 28 percent since 2014, according Ted Rogers, who tracks them on his blog, Biking in LA. But ridership dropped 9 percent between 2013 and 2015, and anecdotally at least, many cyclists say hostile drivers are partly to blame. “People who have been riding for 30 or 40 years are telling me, ‘It’s getting too dangerous out there,’” says Rogers. And many would-be cyclists cite the lack of bike lanes as an obstacle: L.A. has 800 miles of them on some 7,500 miles of streets. After hearing a bagpiper play “Amazing Grace” at Pasadena City Hall, the Ride of Silence cyclists pedal back through Old Town, taillights blinking in the twilight. They’re accompanied by two motorcycle cops; without them, it would be difficult for the bikes to negotiate a particularly tricky left turn off Orange Grove Boulevard where rush hour traffic whips by.